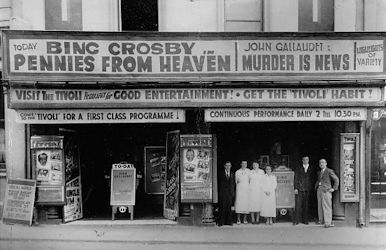 "Murder is News" came out in 1937, a year after "Pennies from Heaven". Courtesy of Plymouth Library Services. The Tivoli Picture Theatre sat only 325 to 350 people and was situated at number 8 Fore Street, Devonport, two doors from the corner of Chapel Street, facing the Military Arms Public House and the larger Electric Cinema. The premises were 65 feet long and 24 feet wide, with the floor sloping towards the screen at the southern end. It was built at the expense of a syndicate of local gentlemen. During the afternoon of Thursday January 26th 1911 an invited audience of ladies and gentlemen attended the opening ceremony and watched seven films, "Grandfather's Violin", "Ancient and Modern Rome", "Max Misses Another Good Chance", "Auld Robin Grey", "The Doctor's Substitute", "The Brigand's Revenge" and "Three by Three". The first public performance took place at 6pm when admission prices were 3d for adults and 2d for children. The licensee at first was Mr A O Ellis but by the end of the year it had passed to Mr Sydenham James Heal. Upon his death in 1925 it passed to Mr S F Heal, presumably his son. In 1927 it was transferred to a Mr Harry Harcourt, its manager, who probably died in 1935 as it then passed to Mrs E R Harcourt. On September 16th 1936 it was transferred to a Mr M Cohen. Two other people held the licence during 1938 and early 1939 but in April it returned to Mr Cohen. He was clearly something of a local entrepreneur. In 1918 he was the 'People's Pawnbroker' at 30 William Street next door to the Morice Town Picture House of which he was the licensee in 1931-32. Later he also built some houses in Weston Park Road at Peverell. How much longer the Tivoli was open is something of a mystery. It was not licensed in May 1939 and there were no adverts in the local papers.